“Water!" 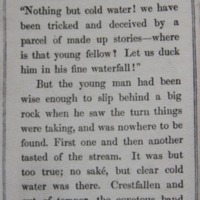 he shouted in a rage, "Nothing but cold water! 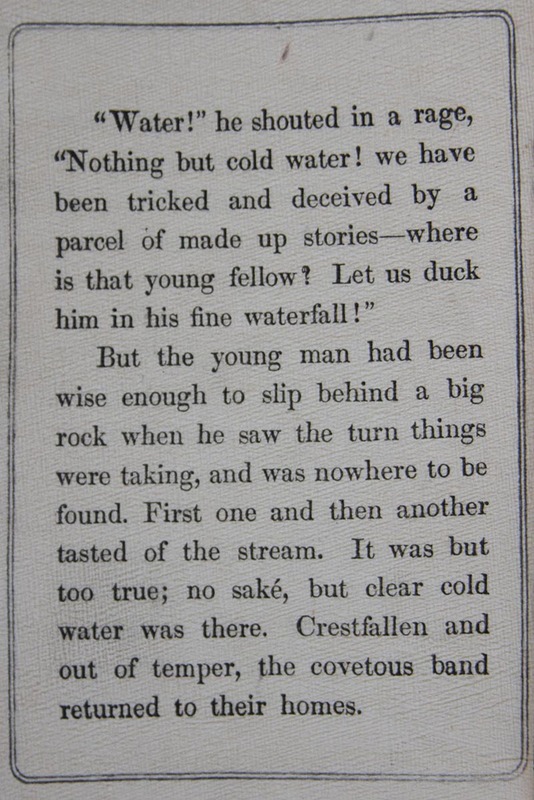 we have been tricked and deceived by a parcel of made up stories-where is that young fellow? Let us duck him in his fine waterfall!" But the young man had been wise enough to slip behind a big rock when he saw the turn things were taking, and was the nowhere to be found. First one and then another tasted of the stream, It was but too true; no sake, but clear cold water was there. Crestfallen and out of temper, the covetous band returned to their homes. Hasegawa, Takejiro, 1853-1938, “Page 16, The Enchanted Waterfalls,” Linda Lear Center Digital Collections and Exhibitions, accessed April 24, 2019, http://lc-digital.conncoll.edu/items/show/883.